Follicular Unit Transplant or FUT Hair transplant, also known as strip technique. In this method, we take a strip of skin usually 1 to 1.5 cm in width and 25 to 28 cm in length is taken from the donor area. 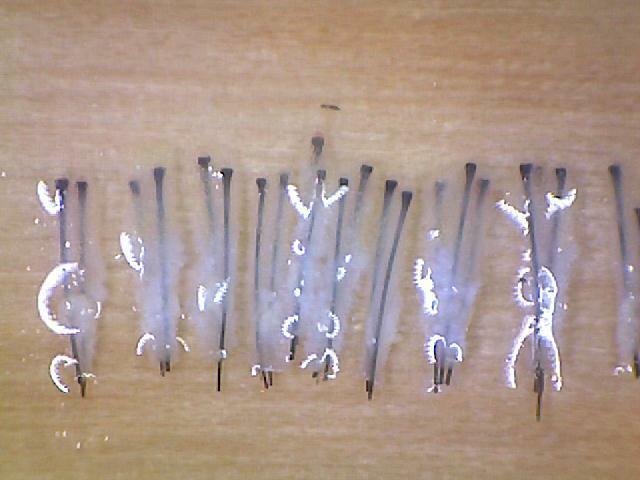 This strip is then dissected under a microscope to get individual follicles which are implanted in the donor area. FUT was the gold standard technique of Hair transplant a few years back. 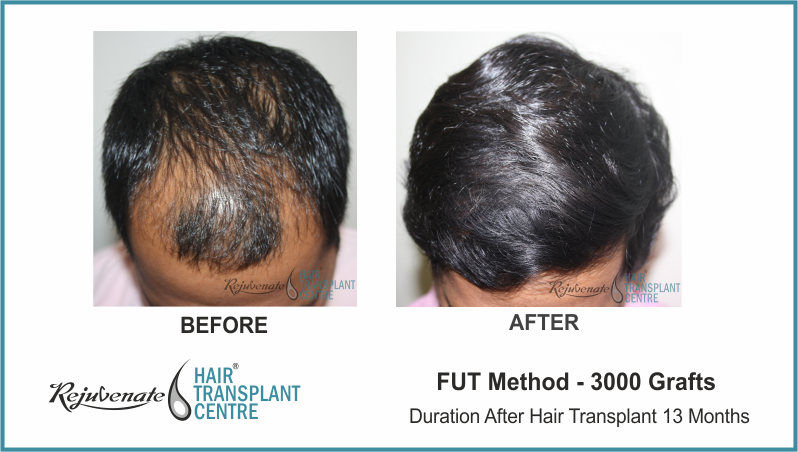 The biggest advantage of FUT Hair transplant India was Follicles was taken from the safe most zone of the donor area. But today patients scared of cut, also nobody wants a linear scar on the back of the head and so this method of hair transplant in spite of having many advantages is becoming rare. When hair transplant is done by strip technique (FUT Hair transplant) then there is a linear scar on the back side of the scalp. Hair does not grow through the scar. This seems to be the biggest drawback of strip technique of follicle harvesting. A trichophytic closure is a technique of closure (suturing) of the surgically created wound in FUT Hair Transplant. After this type of suturing, the hair grows through the scar. Presence of hair in scar makes it less visible. In trichophytic closure, an edge of the lower margin of a wound is de-epithelized, and then suturing of the wound is done. So de-epithelized lower margin is covered by upper margin of the wound. In the de-epithelized lower margin, follicles start growing hair. After healing of a wound, hair comes out through scar. Please note that scar becomes less visible does not means there is no scar at all. 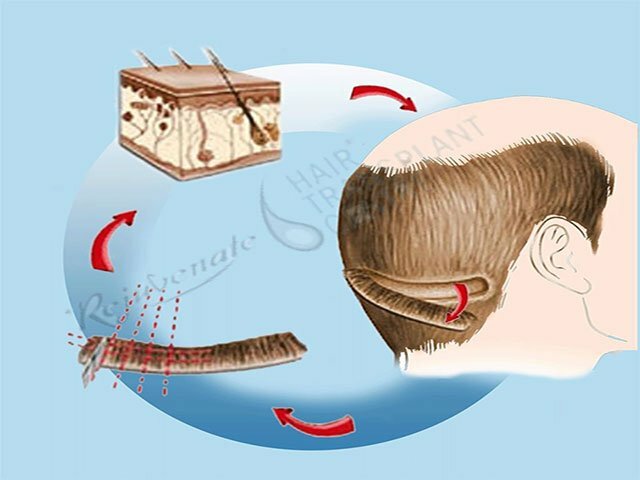 At Rejuvenate Hair transplant Centre all wounds are closed by the trichophytic closure. No extra charges are taken for this. In FUT Hair Transplant you get a linear scar which is almost invisible (trichophytic closure) while there is no linear scar in FUE Hair Transplant. But multiple small circular scars are given after extraction of follicles using the circular punch. If the quality of Punch is good these circular scars are almost invisible. 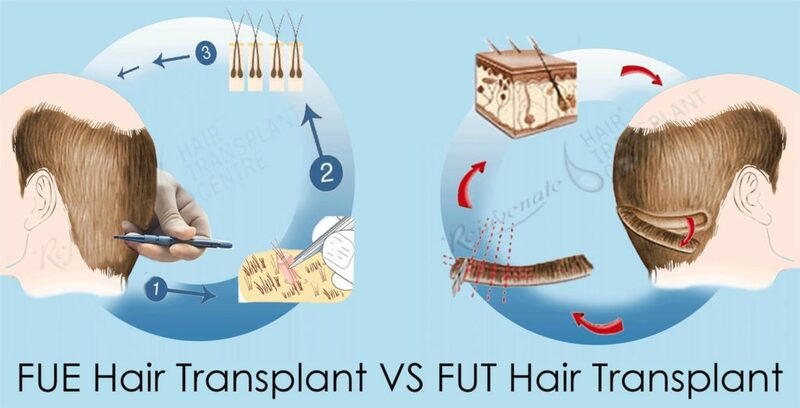 In Hair Transplant, by FUE we can harvest body hair follicles while it is not possible in FUT Hair Transplant. This is the greatest advantage of Hair Transplant by FUE. Now a day it is very common to harvest follicles from beard and chest and we are getting a good hair transplant result even in grade VII patient by the combination of FUT and FUE, or FUE and BHT. Hair Transplant by FUE is also a very good procedure for a small number of follicles to be transplanted like for beard, moustaches, Cleft lip scar, burn scar and for successive stages of hair transplant. In FUT Hair Transplant strip harvesting follicle dissection is done under direct vision using magnification so chances of follicle damage are very negligible. While Hair Transplant by FUE is a blind technique of harvesting follicles It is the expertise of surgeon which determines the rate of follicle transection. At Rejuvenate Hair Transplant Centre Follicle transaction rate is 2-4%. Usually cost of Hair Transplant by FUE is much more then FUT Hair Transplant because it involves more time and expensive disposables to be used in this technique. But at Rejuvenate Hair Transplant Centre we are charging same for both the techniques. Previously it was said that in FUT Hair Transplant more number (more than 3000) of follicles can be harvested in one sitting while this may not be possible in Hair Transplant by FUE, But in recent time we can even harvest 5000 follicles by FUE from scalp, beard and chest.